Former PepsiCo head Donald Kendall is the first foreigner to be awarded Russia’s Order of Honor for his philanthropic efforts. A colorful, tough-minded U.S. businessman and beloved philanthropist, Donald Kendall is now the first foreigner to be awarded the Russian Order of Honor for his support of the arts in Russia. The ceremony, timed to coincide with Kendall’s 90th birthday, took place at the Russian Embassy in Washington, D.C.; the medal was awarded by Sergei Kislyak, Russian ambassador to the United States. Kendall received the medal for his efforts in support of Russian music and the Mariinsky Theatre, which has experienced a resurgence as of late under conducter Valery Gergiev, producing some of the finest musical events in recent years. Many luminaries attended the event. Former U.S. Secretary of State James Baker described Kendall as “vigorous, tough and mean.” Baker, who used to hunt with Kendall in Wyoming, also describd Kendall as thrifty. “Look, he is wearing the same tuxedo he had when he started working with Russia,” Baker said. During the height of the Cold War, Kendall, then the head of the PepsiCo corporation, began doing business in the Soviet Union. The company began to produce Pepsi Cola in Novorossiysk, a city in southern Russia. Alexei Kosygin, then the head of the Soviet government, granted Kendall the right to sell Stolichnaya vodka in the United States. In 1959, Kendall treated Nikita Khrushchev to a Pepsi Cola at the American National Exhibition in Moscow, under the skeptical glance of Marshal Kliment Voroshilov. 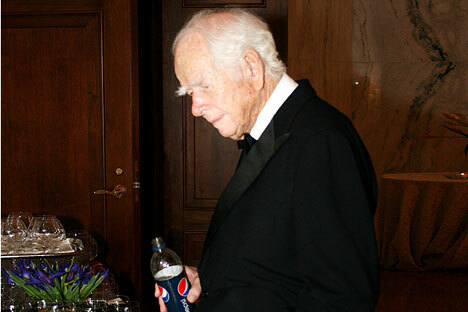 Legend has it that the Pepsi Khrushchev had was not cold enough. “In Russia, PepsiCo is a Russian company,” the ambassador said in an effort to explain Kendall’s enormous success. The company currently has nine plants in Russia. In recent years, Kendall has focused his efforts on charity. He founded the White Nights Foundation of America to support Russian music and the Mariinsky Theatre. Valery Gergiev, artistic director of the Mariinsky, addressed Kendall in a video message, calling him “the symbol of America.” It was thanks to Kendall’s support that the new Concert Hall at the Mariinsky Theatre was built, Gergiev emphasized. Other guests were Henry Kissinger, former U.S. secretary of state; U.S. Librarian of Congress James Billington; Dan Russell, deputy assistant secretary of state responsible for relations with Russia, Ukraine, Moldova and Belarus; as well as the chief executives of several American companies operating in Russia.